Cockfighting is a cultural institution in Thailand and one of its most popular gambling sports. But the fighting—blood on blood contact—is also a perfect scenario for diseases to spread. The Thai government requires that every rooster must be tested for avian flu and registered. 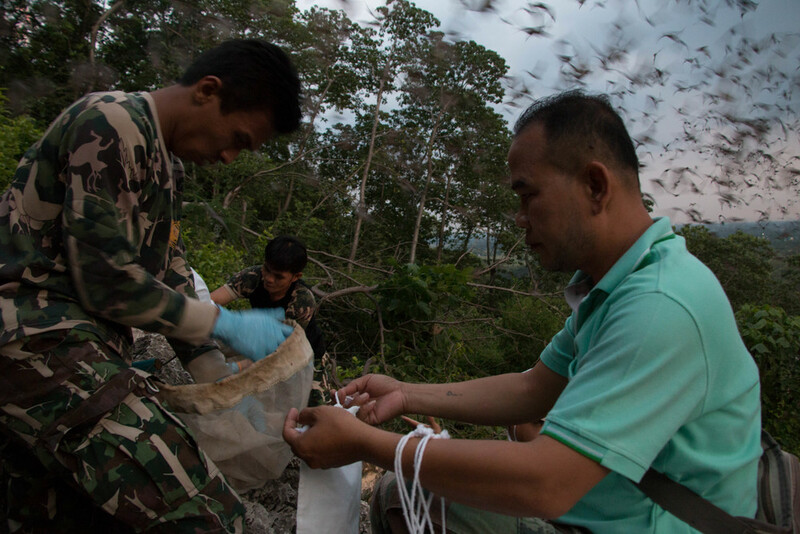 Local Department of National Parks, Wildlife and Plant Conservation rangers catch some of the 2.5 million bats that leave the Khao Chong Phran cave nightly. Pranorm wears white chalk on her forehead to keep the guano fleas from biting her face while she works at Khao Chong Phran bat cave to collect guano. Phra Kru Visutta Nuntakhun is the head monk at Khao Chong Phran Monastery. Pranorm's mother brought her to here to collect guano when she was in the third grade and she’s been doing it ever since. Global epidemics are increasingly being caused by animal diseases spilling over into humans. Thailand’s premier bio-surveillance team is studying bats and other animals to try and get ahead of the next infectious disease outbreak before it happens. At the YSVP headquarters, if you ask for Mike no one will know who you are talking about. If you ask for “Big Mike” they will direct you to Mike Almore. Co-Executive Director Eddie Bocanegra (maroon shirt), and Mike Almore (navy blue shirt). Students smile and joke with friends during art class at the McCormick Tribune YMCA in Logan Square. John Vergara teaches the kids how to paint a waterfall using new brush techniques. John Vergara in his office at the McCormick Tribune YMCA getting organized for the next days work. Almore was born and raised in Pilsen, Chicago. This community, like many across the city, struggles with gang violence. This is not a job for the faint of heart. Mike Almore, John Vergara and Bobby Acuna are three outreach workers who wake up every day to work with youth who live and struggle to survive in violent communities. This is the opening ceremony of Englewood’s first youth baseball league, whose coaches will all be Chicago Police officers. Englewood is a notoriously violent and impoverished neighborhood in the South Side of Chicago. Sawyer is a huge supporter of the new league. The goal is to give neighborhood children positive associations with police officers before they become teenagers to build community trust. Malik has run Your Shoe Repair for a number of years in Wicker Park, Chicago. He's seen the neighborhood through hard times. Malik is a native south sider whose enterprising spirit has driven him to work in many businesses.